Crowns and bridges are advanced restorations that aim to replace badly damaged or missing teeth. Cosmetic correction of unsightly teeth can also be achieved. 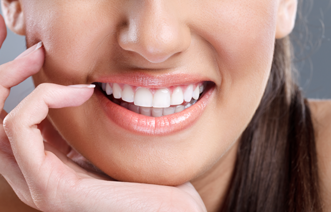 Want to restore the healthiness of your smile? Do it with a dental crown or a dental bridge! 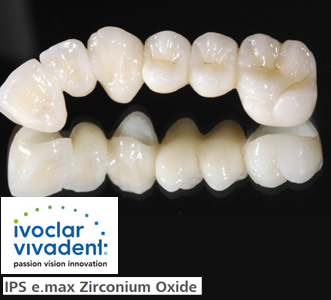 We use the latest metal-free crowns for superior aesthetics and strength – E max and Kavo Zirconia. A dental crown resembles a cap which is used to cover a damaged tooth up to the point where it meets the gum line. Meanwhile, a dental bridge is a fixed partial denture that replaces the form and function of missing teeth – by bridging the gap caused by these lost teeth. A tooth that has been damaged or cracked by tooth decay. The damaged part of the tooth will be covered by the dental crown, restoring both the use and the aesthetics of this affected tooth. A worn tooth is exposed to more damage when not treated properly, and takes on an abnormal size and appearance. A crown can be used to cover this worn tooth to bring back its healthy appearance and normal use. A missing tooth can effectively be replaced with a dental implant, which is then attached to a dental crown as the tooth restoration. Bridges are considered as false teeth, and are used to replace several missing teeth. The gap that these missing teeth have created can be filled in once more with the use of a dental bridge, solving the problem of a smile that looks unhealthy and incomplete because a yawning gap can be seen due to the tooth loss.